Telangiectasias are clusters of abnormally dilated blood vessels near the surface of the skin that often appear thready or spidery. Telangiectasias are a symptom of underlying venous problems, and thus have many causes. When found in the legs telangiectasias are usually the result of a malfunctioning valve. Many veins contain these valves which, when functioning properly, keep blood flowing in one direction – towards the heart. Blood flowing backwards through a malfunctioning valve, also known as venous reflux, engorges affected blood vessels, causing them to dilate and form varicose veins and telangiectasias. 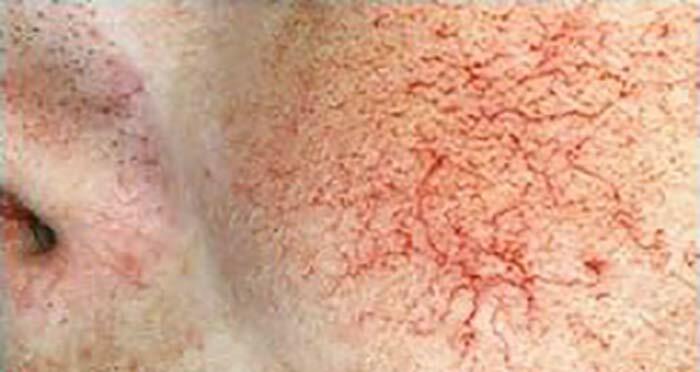 Telangiectasias on the face are often caused by rosacea, a chronic condition involving facial redness, dilated blood vessels, and acne-like lesions in adults. The cause of rosacea is not completely understood, but it is know that in some people genetics plays a role, as well as environmental factors such as the consumption of alcohol, sunlight, extreme temperatures, stress, topical steroids, and certain types of food. Pregnancy can lead to telangiectasias. As the fetus grows it can put pressure on a major vein near the pelvis – the inferior vena cava. This, when coupled with the normal rise in blood volume during pregnancy, puts increased pressure on the body’s blood vessels leading to the formation of varicose veins and telangiectasias. Both often disappear in the months following delivery. There are many genetic conditions that can cause the formation of telangiectasias, including Maffucci’s syndrome, Klippel-Trenaunay syndrome, Ataxia-telangiectasia, Hereditary hemorrhagic telangiectasia, Sturge-Weber syndrome, Bloom syndrome, Cutis marmorata telangiectatica congenital, and Xeroderma pigmentosa. Treating telangiectasias depends on treating their cause. Sclerotherapy is the gold standard for the treatment of both varicose veins and telangiectasias caused by a malfunctioning venous valve, utilizing endovenous closure in more severe cases. Avoiding rosacea triggers can help lessen facial telangiectasias and prevent the formation of new ones. Finally, therapies such as the v-beam laser and IPL treatments can help reduce the appearance of telangiectasias in any location. Telangiectasias themselves are typically benign but can be a sign of an underlying disease or condition. Contact a medical professional if your telangiectasias bleed easily or if you experience a large number of these vascular abnormalities.